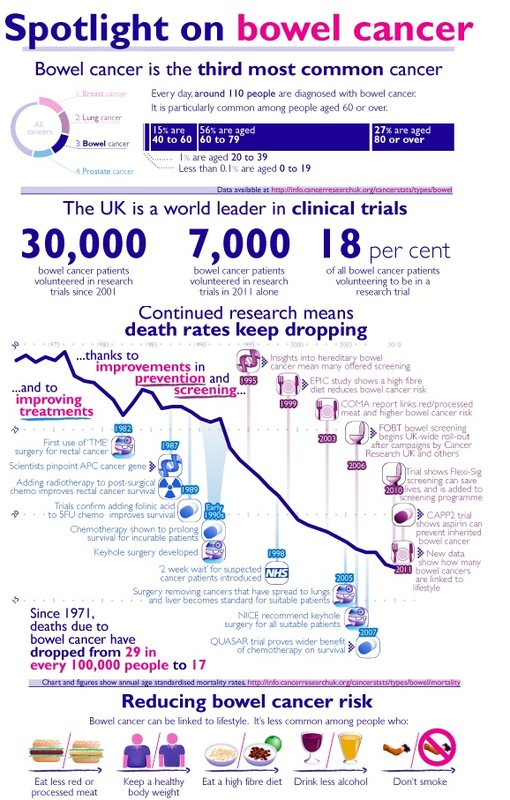 Since 1971, deaths due to bowel cancer have dropped from 29 in every 100,000 people to 17. This falling mortality rate for bowel cancer has been driven by research, with 30,000 bowel cancer patients volunteered in research trials since 2001. Yet a recent story on BJFM suggested that the mortality rate could fall yet further if NICE widened its urgent referral pathway for people with suspected bowel cancer. This infographic highlights the prevalence and treatment options available for the third most common cancer in the UK.